Larissa Gleason tells us all about her time living with bears in Romania- it sounds like she had an excellent time in this amazing location. Thanks very much Larissa! 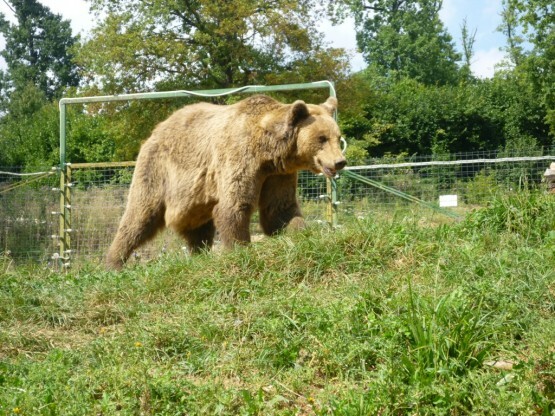 Volunteering in Romania at the bear sanctuary was likely one of the best decisions I’ve made in my life. Besides being a mind-altering and eye-opening cultural experience, my time spent there has sent my enthusiasm for wildlife conservation rocketing. Hiking the sanctuary everyday flanked by a friendly pack of adopted street dogs, watching the rescued wolves with leg abnormalities limp less and less, and observing the bear cubs interact and form hierarchies was a dream opportunity for me. We worked hard at the sanctuary, but the atmosphere was extremely relaxed. The staff are very friendly and despite the language boundaries, Laci and Emi made me feel extremely welcomed and looked out for. The morning pick-up rounds to the markets with Marios were very enjoyable as well. What could have been dull rides to the sanctuary and around town became rides full of friendly banter. We spent a lot of time picking up food for the bears, and I can’t imagine any other driver better to share the time with. through rotten eggs, and categorizing moldy and mashed fruits and veggies collected earlier in the day from local markets, but basically, we did anything needed of us. Working to feed the bears was completely rewarding and amazing- they love their meat, but are amusingly finicky when it comes to the vegetables. The work can be unpleasant and slimy and often hard, but I got over it in minutes and saw the fun in it. Not many of my friends back home would willingly submerse their hands in rotten foods. I’ve never had a job until the sanctuary where when my alarm rang in the morning I didn’t press the snooze button a dozen times. I really loved working here and would have went in an instant if I were asked to work the weekends as well. The bears were fun to watch, especially when they interact with each other. The adults seem to challenge each other more often than the cubs, and do this menacing circley pacing thing that usually resulted into nothing. But occasionally a bit of a fight would break out and end with no harm done (at least, not physical harm). The cubs are adorable, and very playful. I spent a lot of time observing them when a girl came to do research for her college dissertation, and it became apparent very fast that each bear has its own distinct personality. They’re pretty amusing as well, and seem to have mannerisms in line with dogs. I’ve gotten so used to bears being just a few inches away, that occasionally my eyes would trick me into thinking a sanctuary dog was a bear- a bear on my side of the fence- and wouldn’t think anything of it. If you volunteer here, YOU HAVE TO VISIT THE WOLVES! They are awesome! We had to sit patiently for a good while if we wanted to see anything, because they are extremely shy and generally only did stuff if they became used to our presence. I sat there for about 20 minutes with another volunteer in complete silence to witness the three cubs merge together from three different directions to scare off one of the dogs, who was barking at them from his side of the fence. They were silent, swift and AWESOME. The whole scene was about two seconds long and I’ve heard of how wolves excel in teamwork, but I was and still am in complete awe remembering that moment. I felt safer in Braşov than in my hometown in California- which is supposedly the third safest town in the state. The flat is beyond a gate that requires a barcode to get through, is nicely situated at the foot of Mt. Tampa and is only a minute walk away from the centre of town. Everyone is pretty friendly; even the women who stared from their windows as I walked down the street waved once in a while. The only unpleasant strangers I came across were the occasional cashier, but I blame myself for forcing poorly structured Romanian upon them. Romanian or I needed advice on which cultural dish to choose. Actually, he was great with any sort of advice, period. To put it simply, Razvan doesn’t stay in the role of a coordinator; he becomes a friend. It was extremely hard leaving my life in Braşov to return home. Honestly, when my plane landed back in California I found myself secretly hoping that if I stayed seated it would eventually fly me directly back to Bucareşti. Despite being sad to leave, I’ve come home incredibly excited and impatient for life. I’ve known I wanted to work with wildlife and am going to school for it, but my experience at the bear sanctuary has made me entirely EAGER. But even today, two months later, I still find myself thinking of Romania as my second home. Very nice to know. Didn’t realize there were wolves there, too. 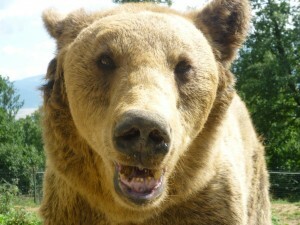 Were they being rehabilitated for release, or is their situation similar to the bears, and they will be there for life?